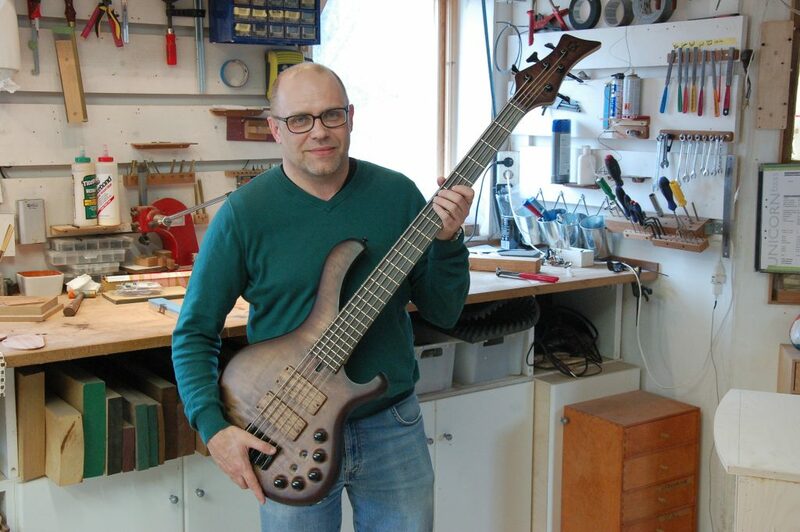 A 12 month year old bass gets a v´new life in a new trussrod that actually work, reinforced neck, and a brand new fretboard with glue set titanium alloy frets. From good to excellence in one week. Here is the culprit. 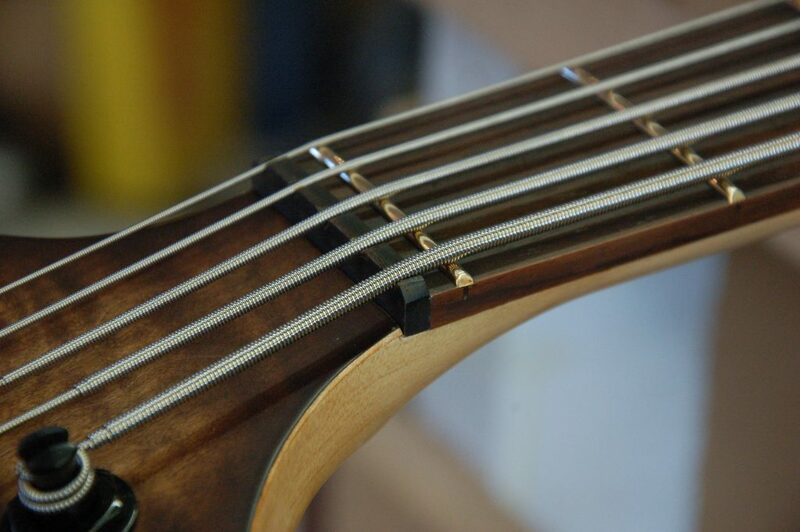 A compression truss rod that had glue on the threads from manufacturing where the truss had simply stuck and couldn´t be adjusted anymore. 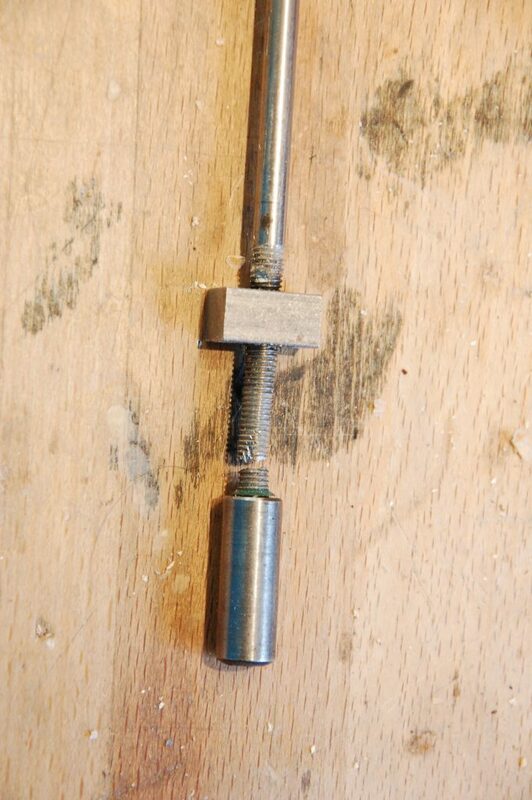 What happens is that the truss breaks instead. 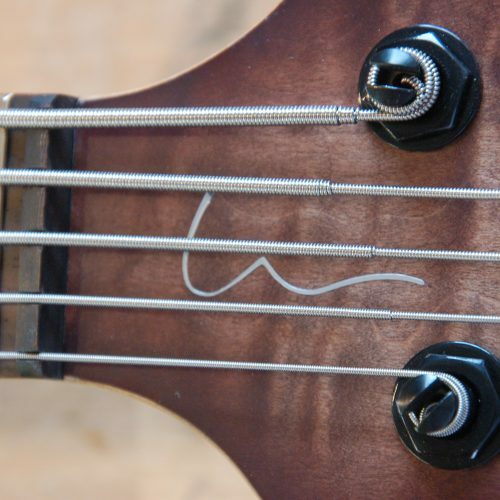 How this bass got through QC just amazes me. 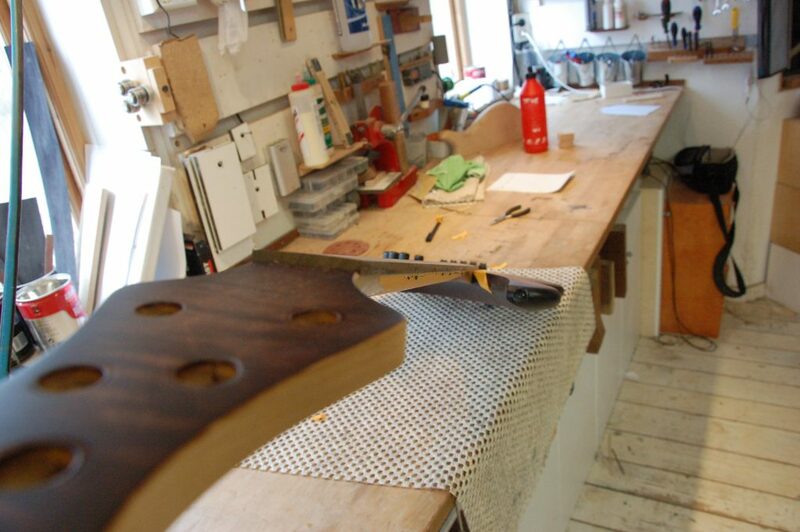 Here is the middle stage of neck routing. 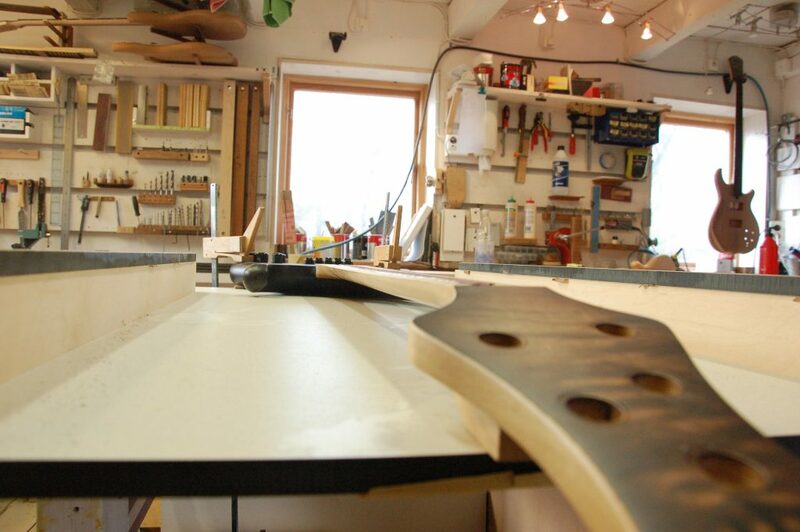 This is where you can see how exact the neck is made. Or not. 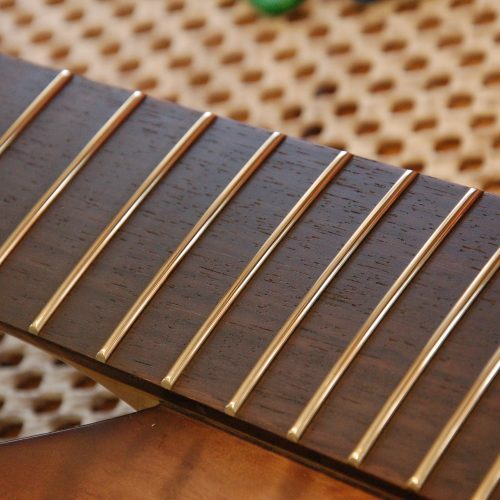 Here´s both fretboard and neck. 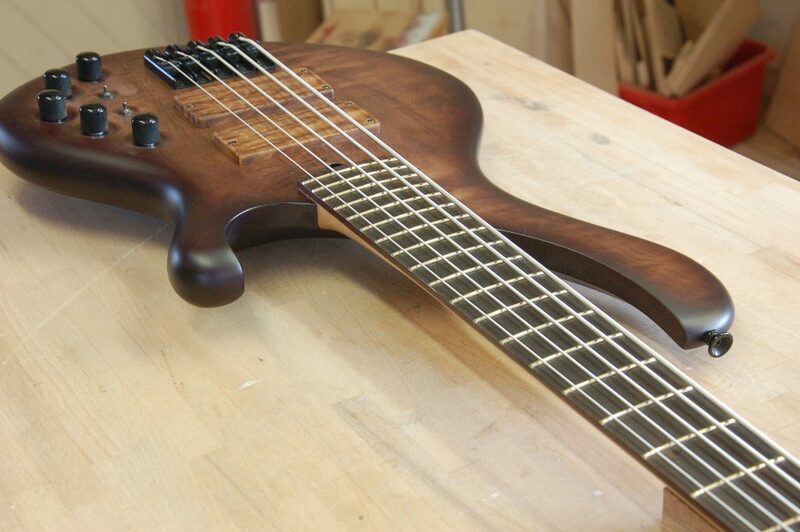 People clearly underestimates the importance of the neck construction. 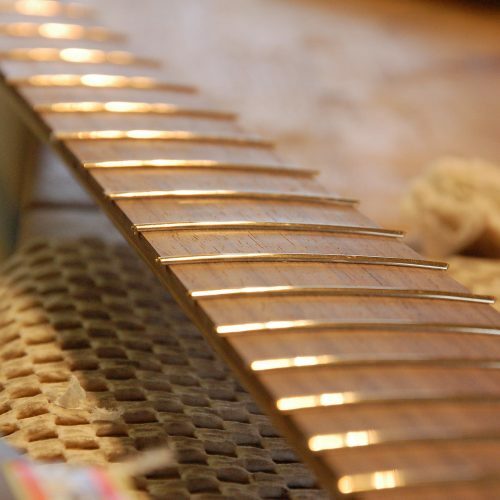 I could chip off bits of the fretboard with my nails. As seen in the picture. 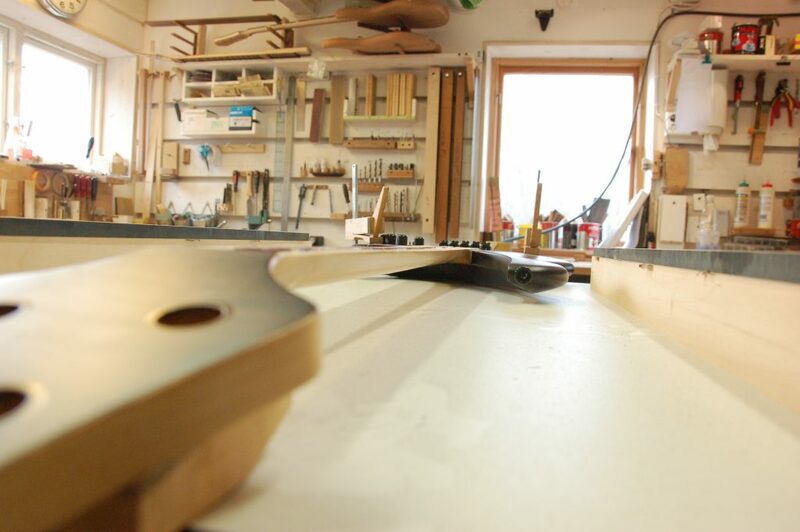 As seen from the body end. 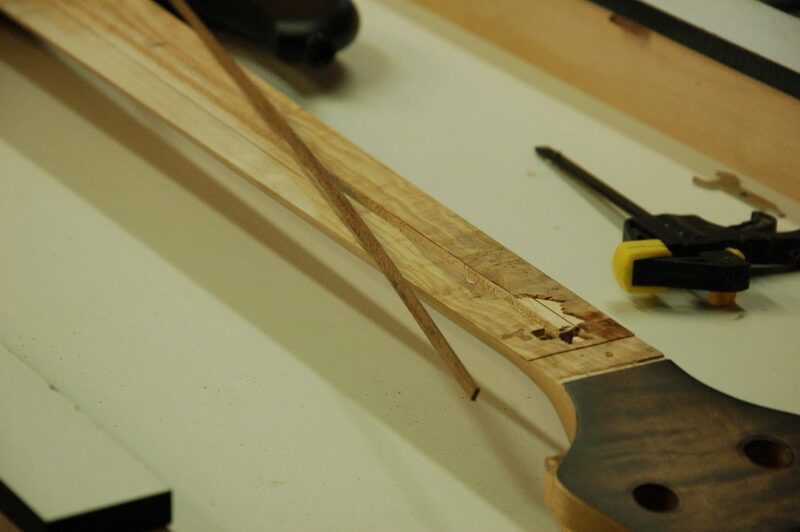 In process with glueing in rods of purple heart to reinforce the neck. 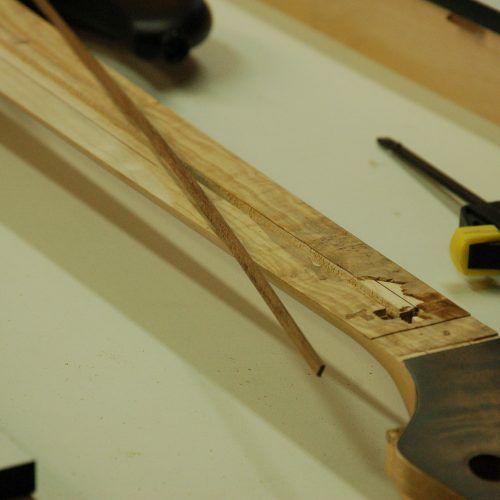 After the reinforcements are glued in, there´s a two day wait for the neck to stabilise before doing the final planing of the neck. 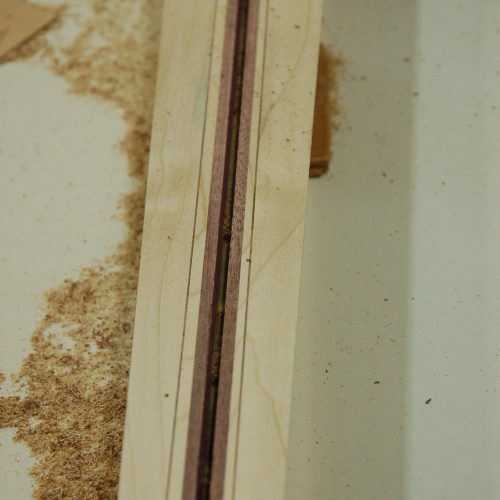 Done properly, the end result will be +/- 0,0 mm perfect. 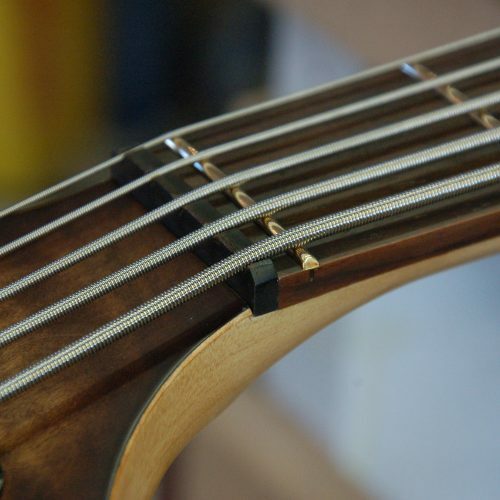 What this does is that you´ll have no problems adjusting the bass to a very low action without buzz and adjusting with our two way trusses will allow perfect adjustment along the entire neck length. 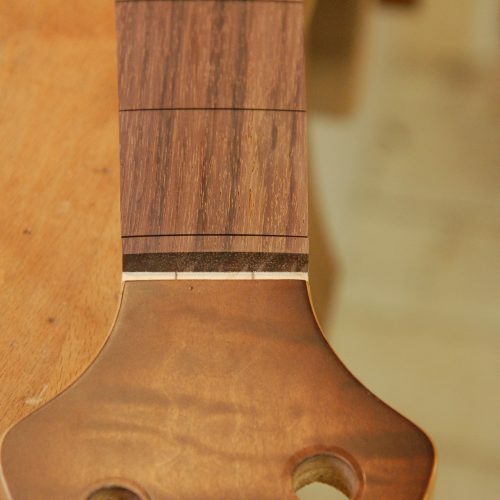 Better view of the somewhat "wavy" neck. 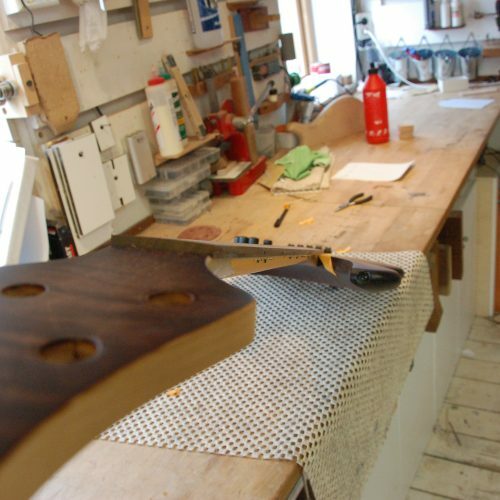 Purpleheart reinforcements in place and neck planed to perfection. 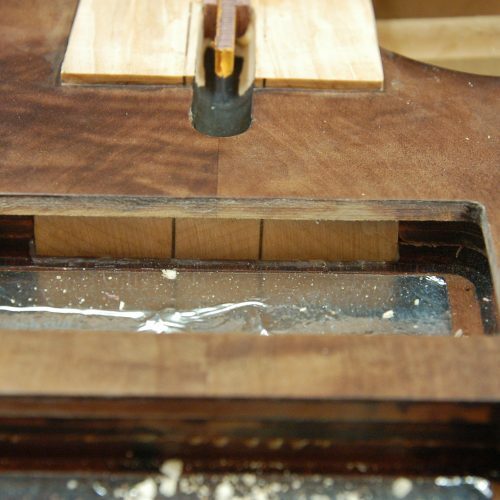 Next is trussrod routing. 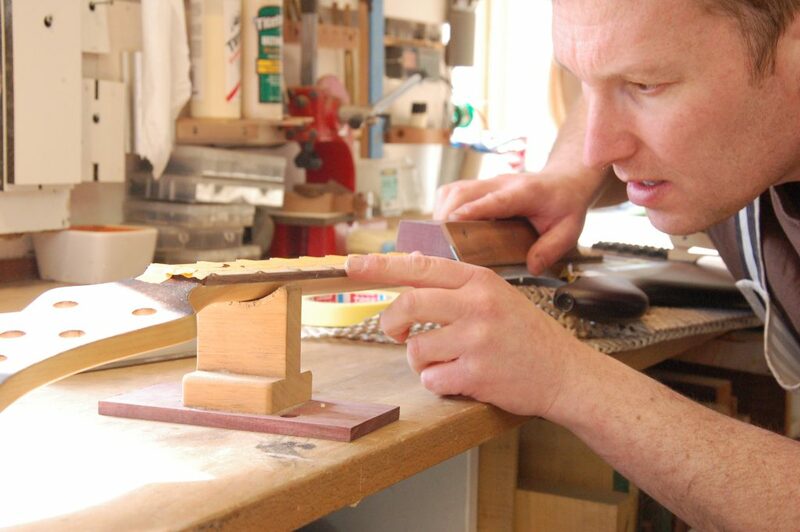 Our rods are completely boxed in and maintenance free for a lifetime or two. 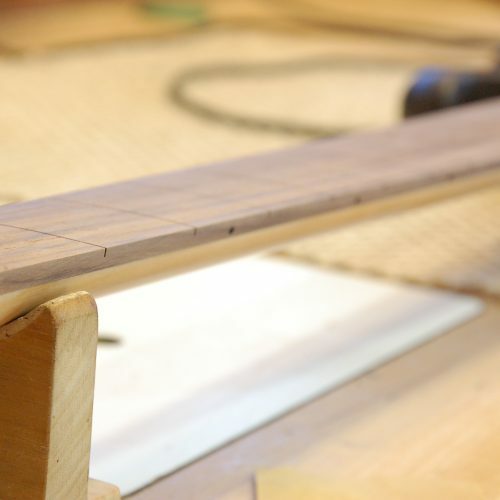 Fretboard on and now´s the trimming part. 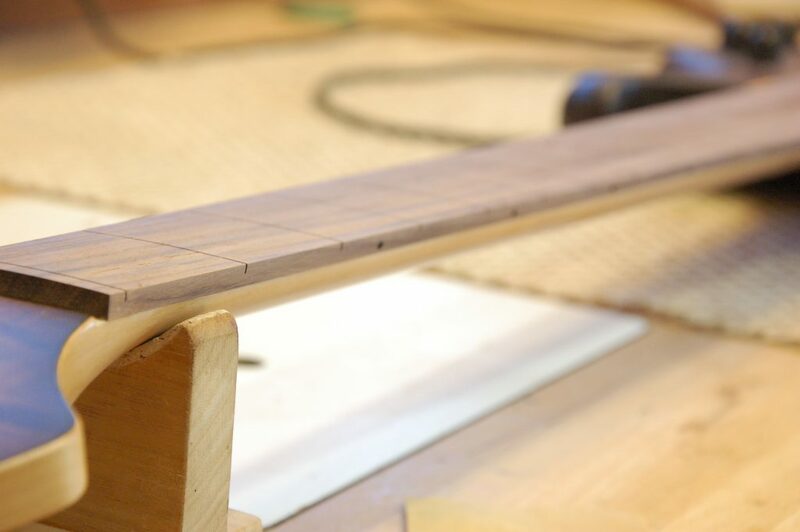 Here´s a secret: Many of the "warped" necks i get in from all over the world are actually warped because of the fretboard setting just a bit off then glued. 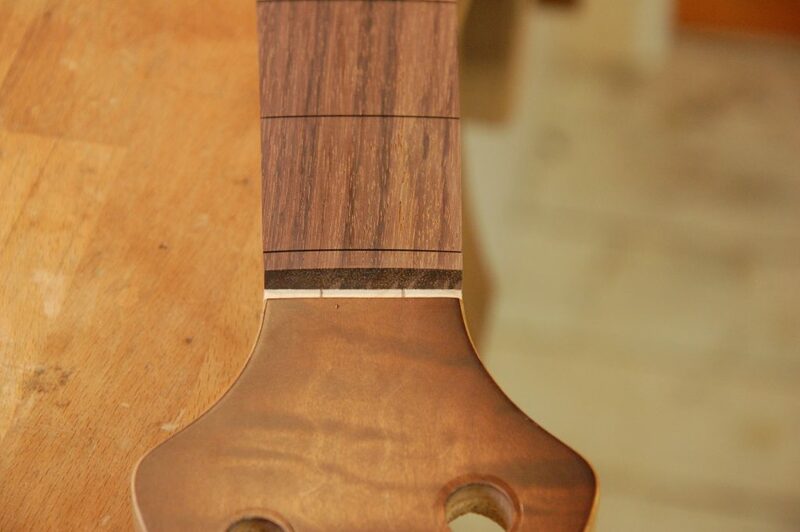 This forces the neck to a warp that can be visible after a couple of years. But since no one has got warranty after a couple years this is irrelevant to manufacturers. 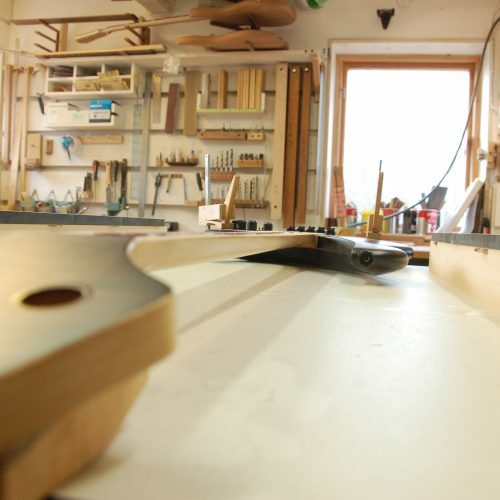 I made a special jig that guarantees excellent results everytime. 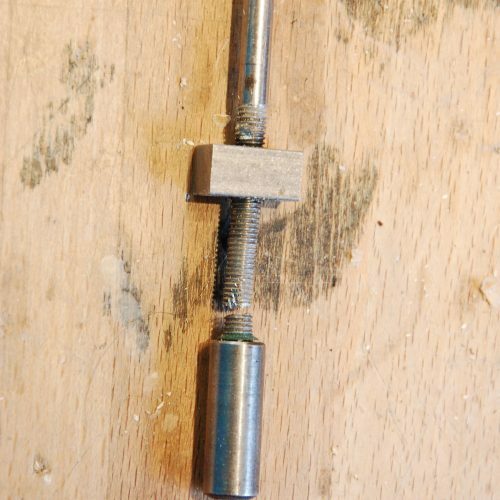 But it takes 10 minutes more time to use… Hence factories won´t use the method. 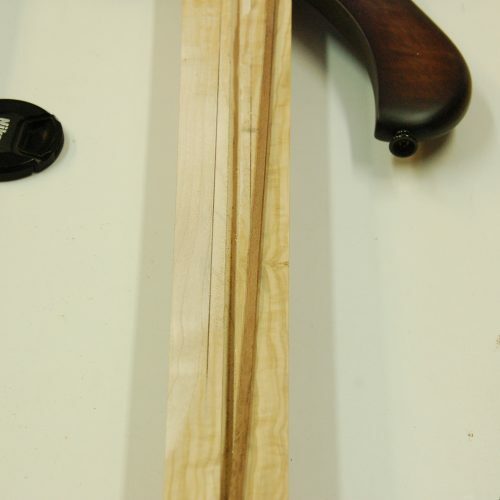 And voila: Warped necks. Ok, getting there! 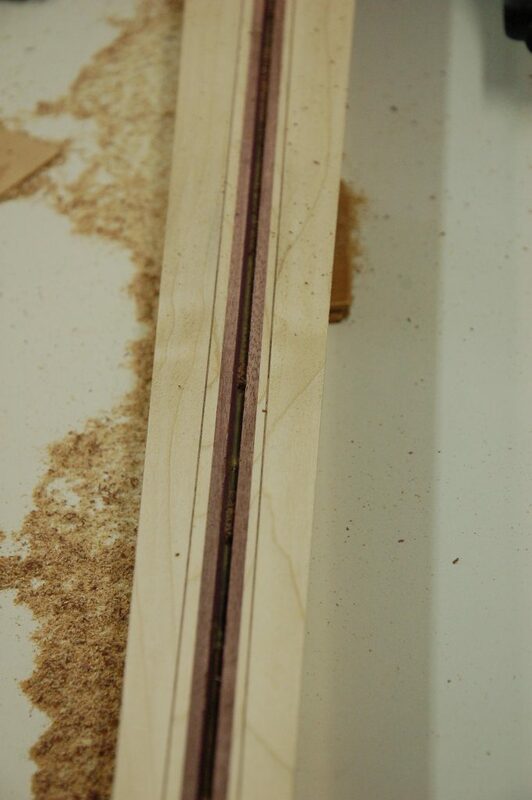 The holes for the dots are routed with a jig I made that set the dots in a exact position. 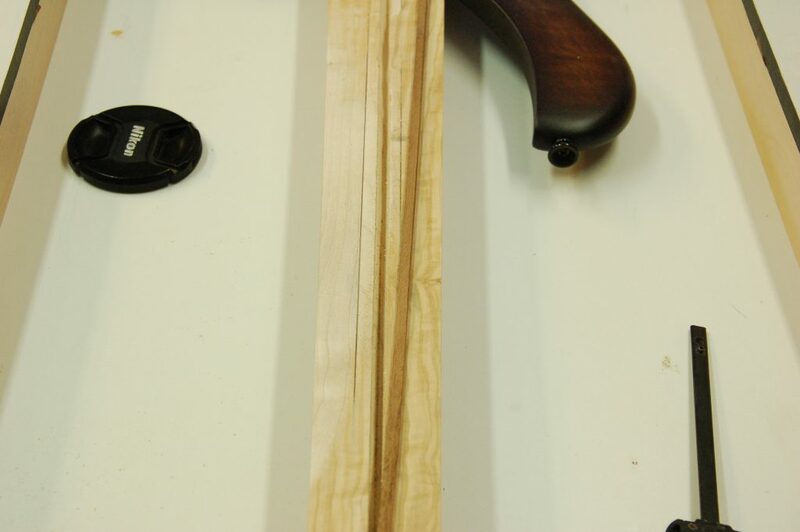 My slight OCD goes bananas if it isn´t that way. Lol! 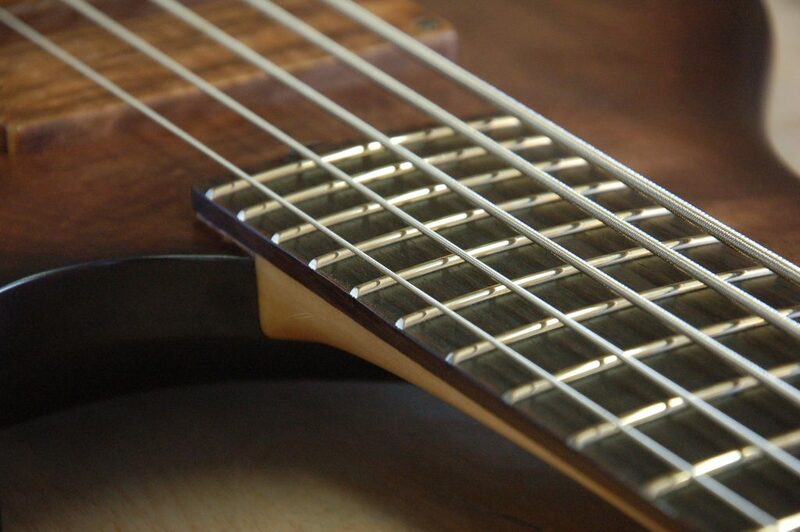 This bass had a zero fret, I think it is the best way, you get a very natural open sounding open string response. 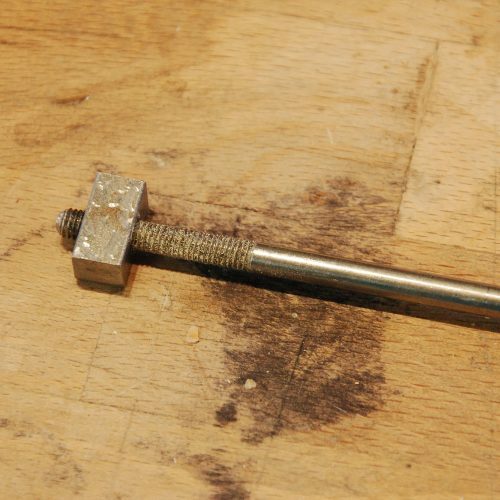 And you´ll never have to set the nut height. So of course I did it this way as well. 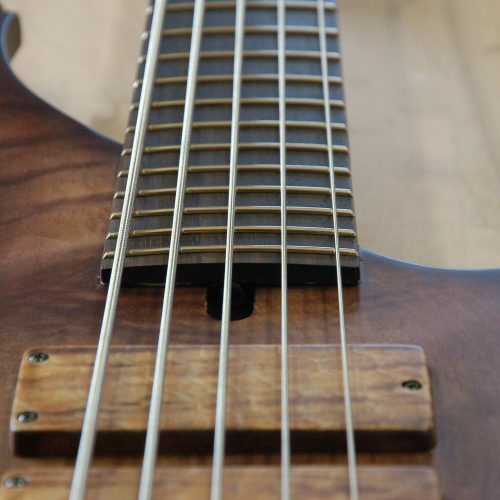 All our basses except for fretless has the zero-fret system. 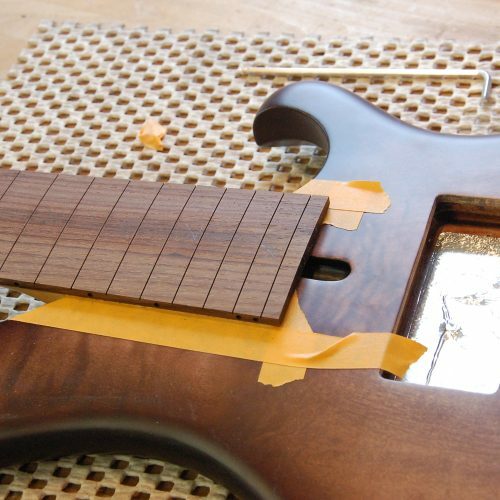 Frets in place and glued. Why glue? 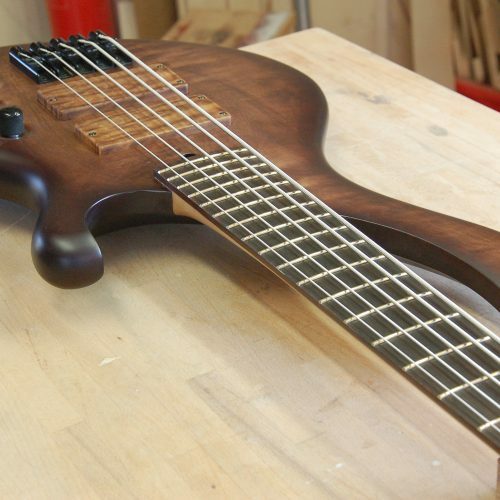 Well, for starters, as a bass manufacturer I have the luxury of doing A/B experiments and glued in frets sound better believe it or not. 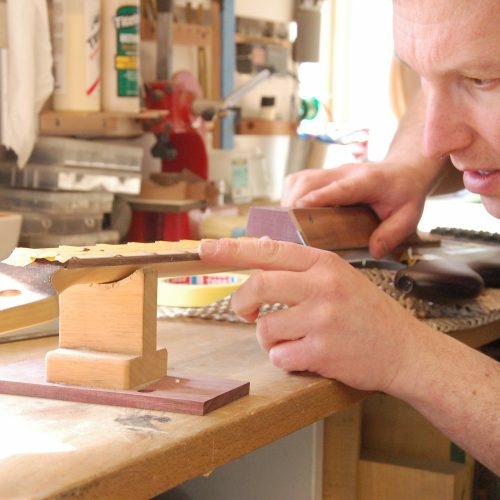 It´s time consuming, that´s why very few use the method though. 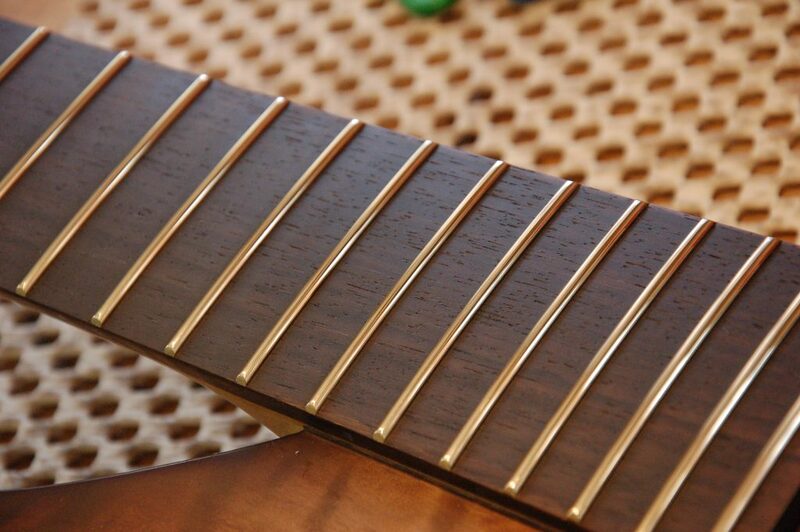 Our frets lasts up to four times as long as the standard frets used. 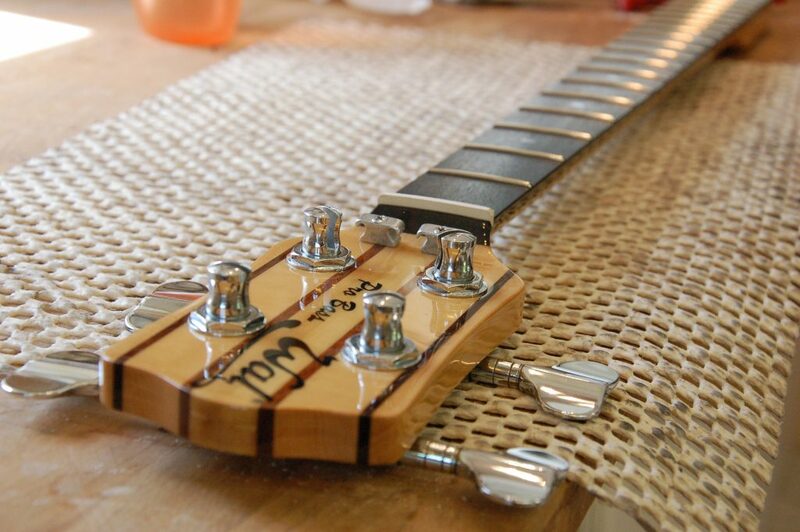 Less fret dressing, better tone. 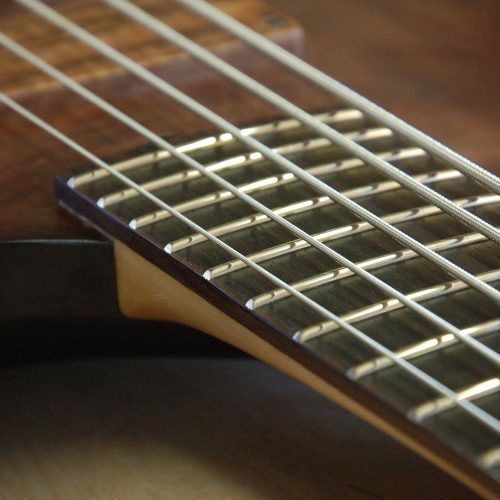 I can re-fret your bass / guitar with these ones. 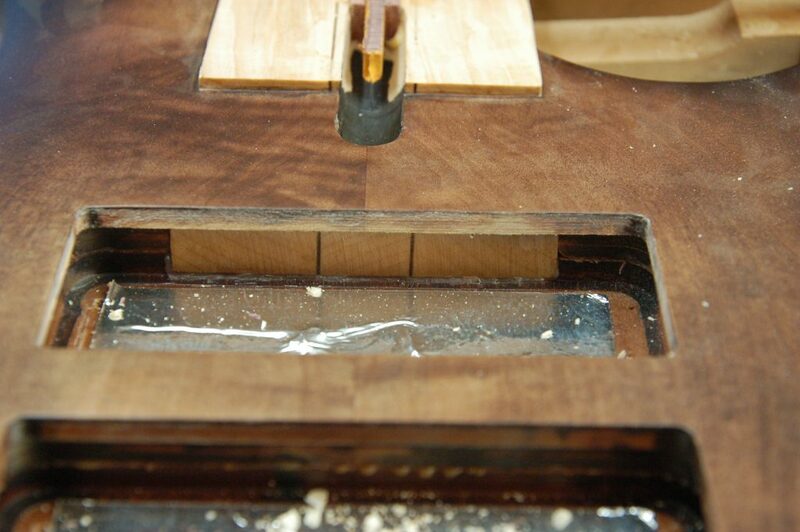 And I will always plan the fretboard to perfection before a refret. 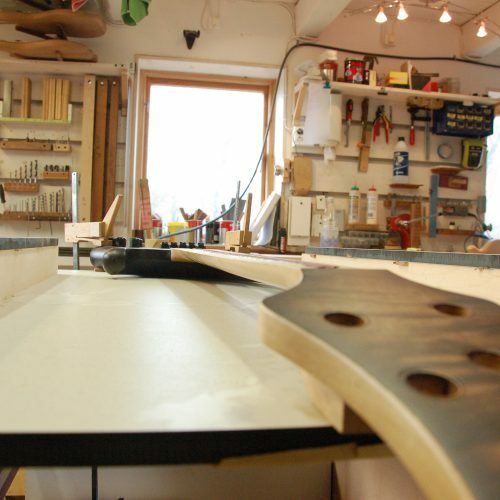 Just a fraction. 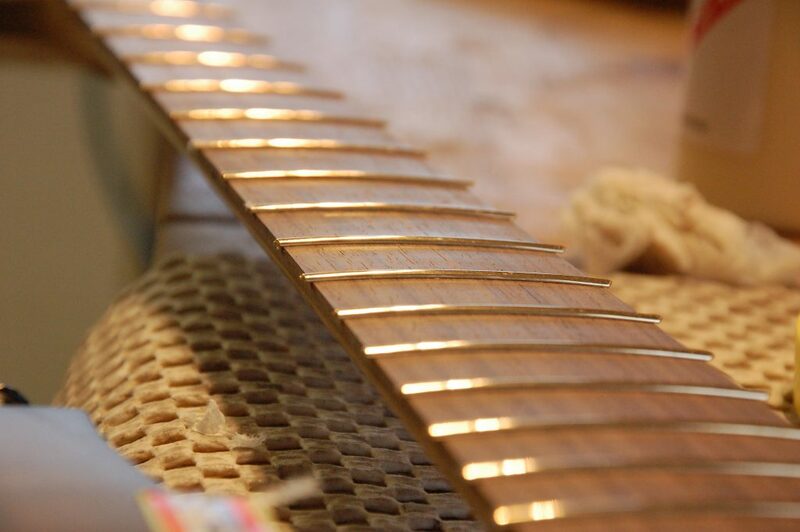 Frets dressed off to an angle. then rounded off. 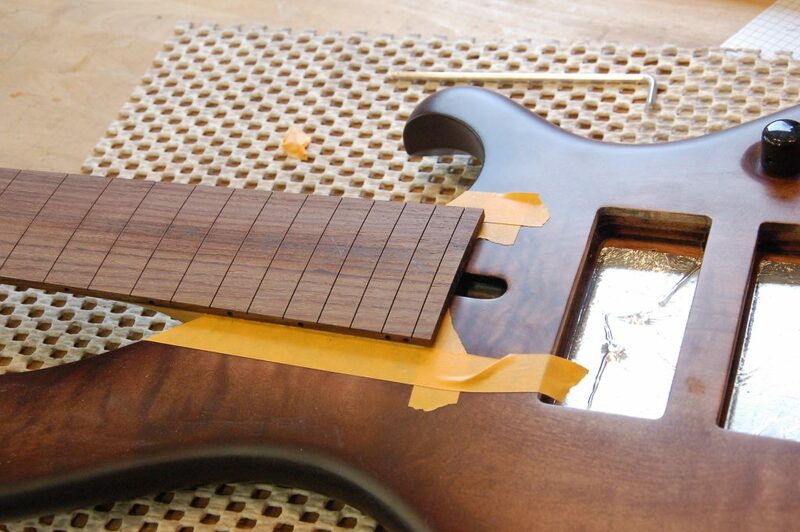 Frets rounded off and waiting for polishing. 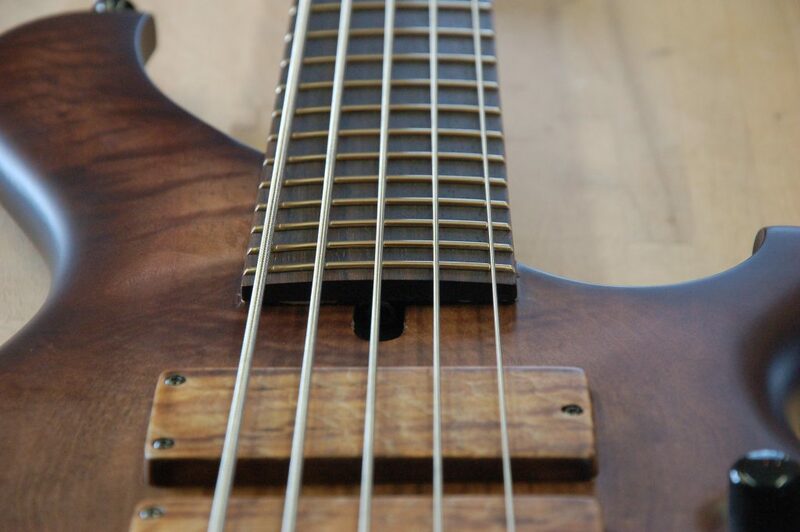 Now sports a fantastic response all over the fretboard and has a fantastic low B string undistinguishable from the E string. As it should be. 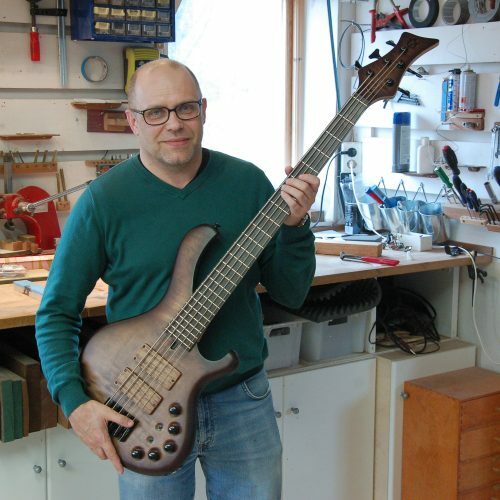 Some would say scrap the bass but there was clearly a potential in it so instead he got a bass that plays and sounds like a €5000 bass and he is very happy with it. 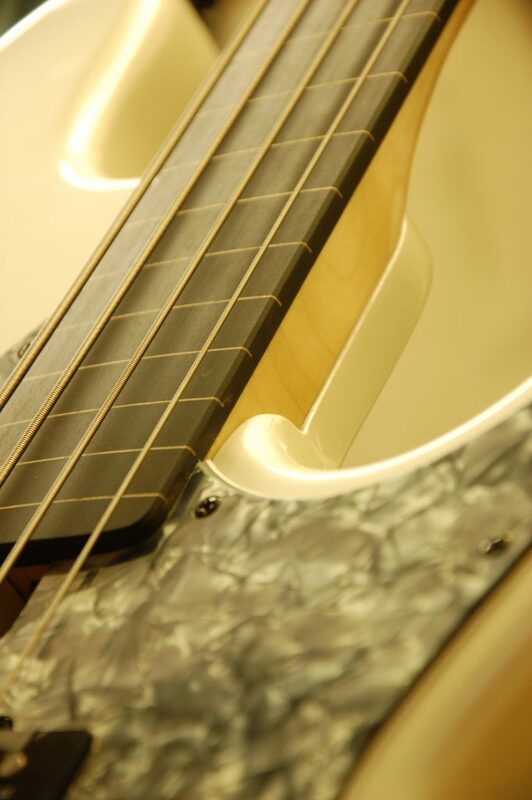 The goal is not only to make it look factory but even better than original. 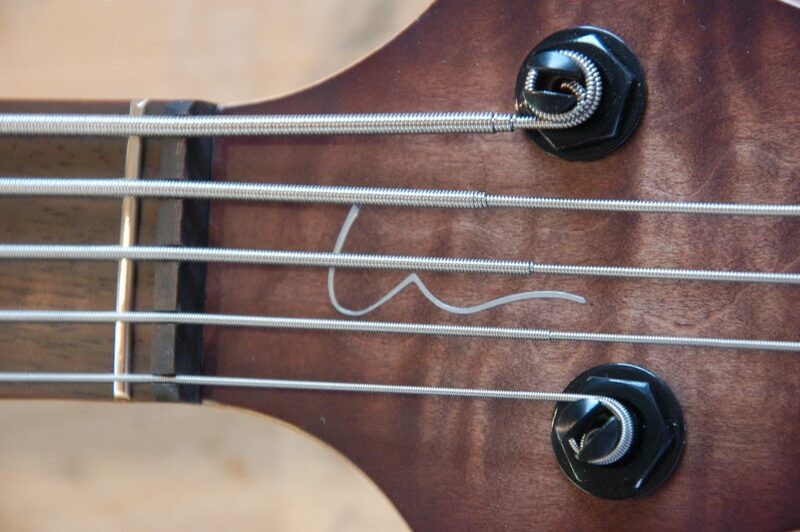 And it´s a totally different bass now. For the better.